JAMES RIVER, NS – Donald Chisholm (Antigonish) won the rain-shortened Lucas Oil 150 at Riverside International Speedway Saturday night in dominating fashion, leading 138 of the completed 144 laps. Chisholm took home his first win of the season over Cole Butcher (Porter’s Lake) and Cassius Clark (Farmington, ME). Butcher sits second in the standings, 20 behind Chisholm. Dylan Blenkhorn (Truro) finished fourth in the Lucas Oil 150 and will also enter the season finale 20 points behind leader Chisholm. The fourth of the championship contenders, Darren MacKinnon (Milton Station, PE), completed the top five in the race. 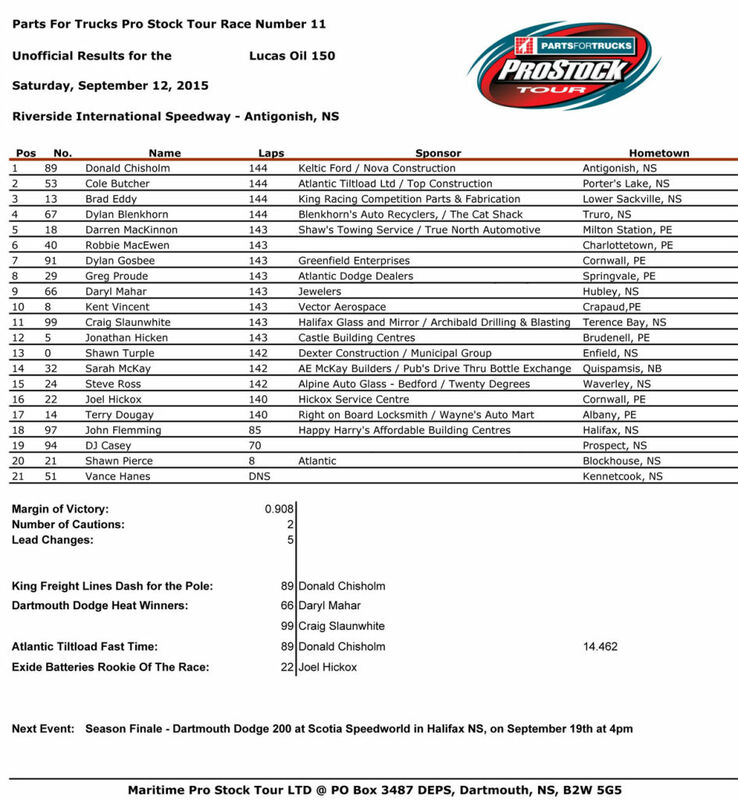 Chisholm kicked off the day in style pacing Atlantic Tiltload Time Trials with a fast lap of 14.462 seconds and winning the King Freight Lines Dash for Cash which earned him pole position for the Lucas Oil 150. Daryl Mahar (Hubely) and Craig Slaunwhite (Terence Bay) won their respective Dartmouth Dodge Heat Races. Only four drivers finished on the lead lap of the Lucas Oil 150, which featured only two caution periods within the first 50 laps. With heavy mist in the surrounding area, the race was run under heavy cloud cover; eventually the mist covered the track which resulted in the checkered flag being thrown six laps shy of the advertised distance. DJ Casey (Prospect) officially sealed the prestigious Exide Batteries Rookie of the Year Award for 2015 after his 19th place finish in the Lucas Oil 150. Casey will receive the unique Exide Batteries Rookie of the Year trophy at the annual awards banquet taking place on November 14 in Dartmouth. Casey’s rookie competitor Joel Hickox (Brudenell, PE) took home the Rookie of the Race Award with his 16th place finish. The Napa Sportsman Series kicked off the show with the Highland Home Building Centers 75 prior to the Lucas Oil 150. Kyle Reid (Sydney) came home first, Dale Richardson (Stellerton) and Dave Timmons (Inverness) rounded out the podium. This event closed the 2015 season for Riverside International Speedway; the coming months will see announcements regarding 2016, year 47 for the facility. The Napa Sportsman Series completes its season September 26 at Cape Breton Miner’s Memorial Speedway. The Parts for Trucks Pro Stock Tour will close out the season next Saturday at Scotia Speedworld. The Dartmouth Dodge 200 will decide who takes home the prestigious championship and the $10,000 cheque; racing starts at 4 p.m. Tickets are available at the gate on race day (cash only).